Going to exhibit at a trade show and want to create something that really stays in the visitors mind? Something they look at and that doesn’t disappear in their bags and is never looked at again – but something that’s of relevant value for people visiting the trade show and your booth? It’s easier than you think! Just have a look at this example. The organizer wanted to show the attendees of the XMPie Users Group 2016 that the Buckhead area around the event location includes many interesting spots to spend their evening after a successful trade show day over some drinks and delicious food. Locr created a LOCALmap that shows 14 locations of bars and restaurant near the Grand Hyatt in Atlanta Buckhead. Next to the map, a list names all locations that are pinned on the map. Best of all, it also shows the walking distance in minutes from the Hyatt to the particular location and on top gives a vivid example on what is possible with the locr services. The XUG16 Atlanta Bar + Restaurant Guide was included in the welcome package every attendant of the XUG16 received on their arrival in their hotel room. Take a closer look at the XUG16 Atlanta Bar + Restaurant Guide! The guide also gave information on where to find more information on GEOservices and maps by locr and the invitation to visit locr at XUG Conference and learn more on the locr services. 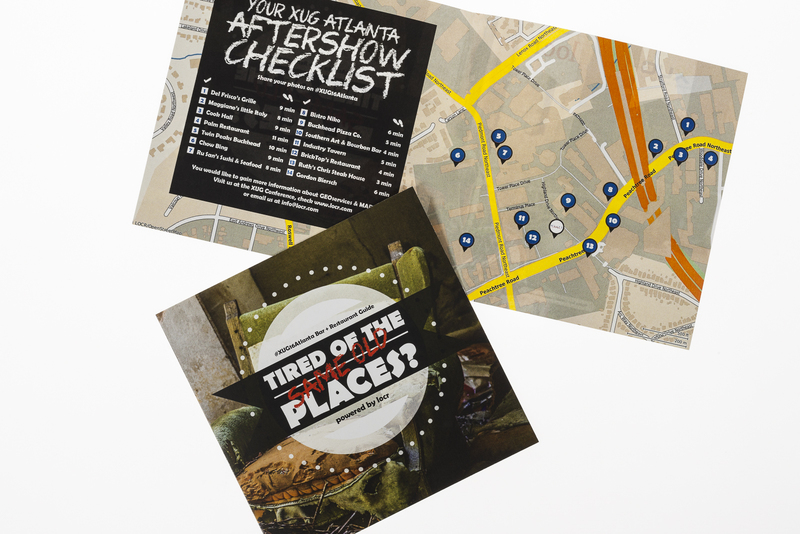 The XUG16 Atlanta Bar + Restaurant Guide is a good example for a campaign that uses relevant information and good design to create a memorable product that moves the reader to action and adds value to their particular situation.